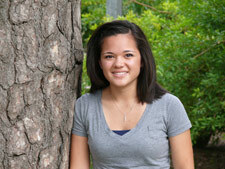 Francesca Moral is a senior in the Department of Kinesiology and Community Health. She will complete a double concentration in health education and promotion, and rehabilitation and disability studies, along with a minor in chemistry. Over my three years in the Department of Kinesiology and Community Health, I have learned that from the advising staff to the courses, everything that is offered allows students to develop and to experience their degrees to the fullest, creating well-rounded graduates. The most beneficial experience I have had so far has been my volunteer internship at the Champaign-Urbana Public Health District, where I worked with the Department of Health and Wellness Promotion. I spent a summer with the health educators, helping with educational programs for people all around Champaign County that focused on attaining and keeping healthy habits. The experience helped me to realize how passionate I am about the health field. I enjoyed it so much, I am returning there to complete my required internship this fall. I work as a university tour guide with the Office of Undergraduate Admissions. I am a member of Illini Pride and I participate in intramurals. I am gaining research experience with the Strong Kids Project, looking at childhood obesity. I am also involved with I-LEAP, the the Mannie L. Jackson Illinois Academic Enrichment and Leadership Program, as both an I-LEAP Scholar and a mentor for incoming freshman. I volunteered at Crisis Nursery and am currently volunteering in the Emergency Department of Provena Covenant Medical Center. I am also the Community Health ambassador on the College of Applied Health Sciences Student Council. I hope to get into medical school after graduation and go into sports medicine. My favorite thing to do is to get together with my friends and play different sports all over campus. In my down time, I like to go running, read, and catch up on sleep. I would recommend AHS and KCH primarily because of the options you have with a degree from this college, and because of the personal and academic support you get in reaching your goals. Advisors and professors are always there to listen and help in whatever way they can. The courses are great, and there are a large number of extracurricular activities offered that students can take part in.